Unit Creators - Ahoy, ye mateys! 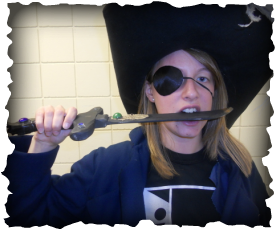 Welcome to Our Pirate Unit! Hi! My name is Sarah, and I am currently a junior at Dordt College majoring in Secondary Education: Biology/Chemistry with a middle school endorsement in science and English. Some of my hobbies include swing dancing, figure skating, camping, and reading. I helped put this site together, so feel free to email me if you have any questions about our unit at srhkhnc@dordt.edu. 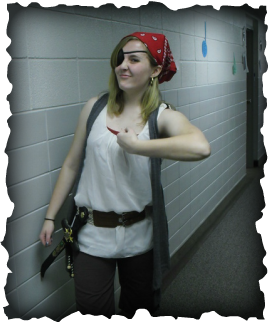 Hey pirates! I'm Ashley, and I'm an elementary education major at Dordt College with an endorsement in middle school math and English! 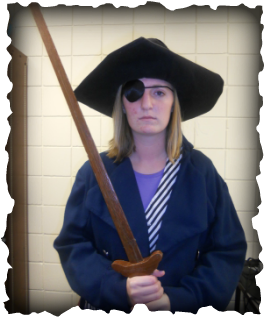 For this pirate unit, I wrote the social studies lessons on specific pirates and the math lessons. In my spare time, I love spending time outdoors, knitting, baking, laughing, playing cribbage, visiting coffee shops, and watching movies with my friends. I love working with kids. During my summers, I can be found at East Iowa Bible Camp playing with kids and growing closer to God alongside them. I want to teach overseas somewhere, but we'll have to wait and see where God places me! Hey! 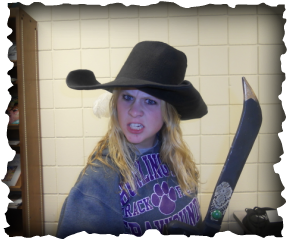 I’m Samantha, a junior Elementary Education major at Dordt College. I am also studying to complete endorsements in middle school English and middle school social studies. I enjoy being outdoors, playing the piano, reading, and hanging out with family and friends. In the future, I would like to teach in a Christian school and see where God will use me in my students’ lives. I completed the Bible and social studies culture lessons for this unit. Hope you enjoy using this unit! Ifyou have any questions, please feel free to email me at smnthvnz@gmail.com. Ahoy, ye mateys! I'm Kristin, a junior English/Secondary Education major at Dordt College and am also studying to complete endorsements in middle school English, middle school social studies, and teaching English as a second language. When I'm not creating integrative unit plans, I enjoy biking, hiking, shopping, reading, and watching just about any genre of movie. I'm also a huge fan of criminal investigation television shows, poetry, cardigans, musicals, purple Skittles, headbands, and card games. In the future, I believe I am being called to teach in a low income area, such as rural Africa or an American inner city, and I'm definitely looking forward to the many opportunities God may lead me towards. I completed the English and technology sections of this unit and hope you enjoy the creativity of the unit! :) If you're curious about implementing any part of the unit into your classroom, I'd love to discuss it with you! Shoot me an email at krstnjns@dordt.edu.